Melanie and Dale Franz and son Darren pull weeds Sunday along sidewalks in Marion’s downtown business district as their contribution to HMBC’s service day. Sometimes it’s hard to show love toward your neighbors without getting your hands a little dirty. Rather than inhabit their clean and comfortable worship center this past Sunday, more than 200 people from the Hillsboro Menno­nite Brethren Church expressed their love for God and their neighbors by sending work teams into surrounding communities with gifts of tangible, sweat-producing labor. Erin Beavers, chair of the congregation’s Local Ou­t­reach Board, said the congregation had done a similar service-based Sunday a year or two ago. That day focused on opportunities exclusively in their hometown. “When the Local Outreach Board was developed this year, it was to get outside our church walls,” Beavers said. “Our church mission and vision is about reaching people for Christ in Hillsboro, but also in Marion County. And so they did, for about a three-hour effort. One group of 35 people went to Lehigh to work on some of big clean-up projects. Thirty people from the church came to Lincolnville, where they painted the interior of the community building and cleaned up the picnic areas in the city park. 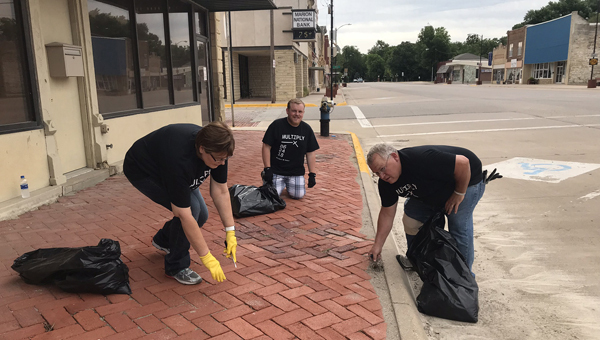 In Marion, a team of 22 people picked up trash, pulled weeds in the downtown area and did limb cleanup in the park and cemetery. Several additional teams were assigned to Hillsboro projects. A team of 20 people served at the elementary school, trimming trees and hauling branches from the tree line. They also cleaned up and painted a bit in the west playground area. Another 20 people served at the city park, prepping the shelter houses for painting. A group of 11 volunteers served at an individual’s house in town by prepping and painting the exterior. Fifteen people served at Tabor College, moving furniture and resetting dorm rooms after a week of Tabor Junior Camp. Sixteen people served at the home church, providing childcare for those who were part of other projects. 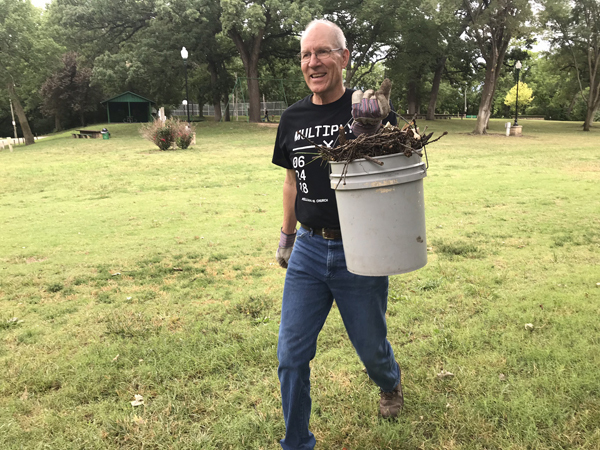 Twelve people—a mix of adults and middle school age kids—served by cleaning the dugouts at the sports complex, delivering a truckload of food to the Main Street Ministries food bank, and pulling weeds around the church. Seven served by praying over the day. Fifteen people worked in the church kitchen to serve the fellowship meal of Pizza Hut pizza and veggies that followed the end of the work projects. To get ideas for service projects, Beavers said the planning group went to city officials in the various communities. “We went through the mayors, we went through the businesses, we went through the rec departments in different towns,” Beavers said.